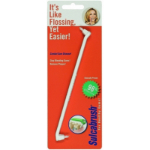 The Sulcabrush is recommended for patients who have difficulty flossing! The Sulcabrush was proven better than dental floss in some parts and equal to dental floss in other parts of the teeth and gums for the removal of plaque and the reduction of gingivitis (gum infection). 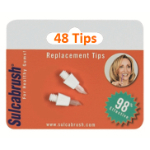 The Sulcabrush is specifically designed to access interproximally and along the gingival margin to remove plaque and help stop the gums from bleeding. Any bleeding or tenderness which may occur initially may soon fade as the gum tissues become firm and healthy. The Sulcabrush can even be used while watching TV reading or traveling! The Sulcabrush is angled differently on each end for better access to all parts of the mouth. The Sulcabrush contributes significantly to improving patients home care techniques. 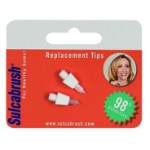 The Sulcabrush is excellent for cleaning around crowns bridges tooth implants and orthodontic bands. 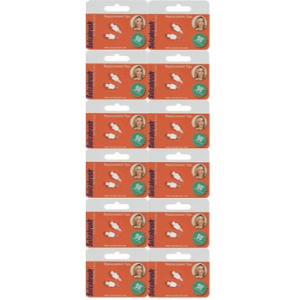 The Sulcabrush is accepted as an effective cleansing device which reduces gingivitis as part of a program for good oral hygiene to supplement the regular professional care required for oral health. Studies supporting the effectiveness of the Sulcabrush have been performed by: Columbia University - School of Dental and Oral Surgery. University at Buffalo - School of Dental Medicine. Indiana University - School of Dentistry. The Dental Advisor Plus - Dental Consultants Inc.